An Wang made important inventions relating to computer memories and to electronic calculators. He was the founder and longtime executive officer of Wang Laboratories Incorporated, a leading American manufacturer of computers and word processing systems. An Wang was born the oldest of five children on February 7, 1920, in Shanghai, China, to Yin Lu and Zen Wan Wang. His father taught him English at home and Wang began his formal schooling at age six when he entered the third grade. In elementary school, Wang began to excel in science and mathematics. He became interested in radio as a high school student, built his own radio, and went on to study communications engineering at Chiao-Tung University in his native city. After graduation he stayed on at the university for another year as a teaching assistant. 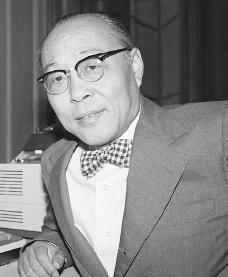 With the outbreak of World War II (1939-45; a war in which France, Great Britain, the Soviet Union, the United States, and other European forces fought against those of Germany, Japan, and Italy), Wang moved to inland China, where he spent the war designing radio receivers and transmitters for the Chinese to use in their fight against Japan. Wang left China in the spring of 1945, receiving a government stipend (financial support) to continue his education at Harvard University in Cambridge, Massachusetts. He completed his master's degree in communications engineering in one year. After graduation, he worked for an American company for some months and then for a Canadian office of the Chinese government. In 1947, he returned to Harvard University and rapidly completed a doctorate degree in engineering and applied physics. Wang married in 1949, and he and his wife had three children. Six years later Wang became an American citizen. In the spring of 1948 Howard Aiken (1900–1973) hired Wang to work at the Harvard Computation Laboratory. This institution had built the ASSC Mark I, one of the world's first digital computers, a few years earlier and was developing more advanced machines under a contract from the U.S. Air Force. Aiken asked Wang to develop a way to store and retrieve data in a computer using magnetic devices. Wang studied the magnetic properties of small doughnut-shaped rings of ferromagnetic material, or materials that can become highly magnetized. Wang soon developed a process where one could read the information stored in a ring by passing a current around it. Researchers at the nearby Massachusetts Institute of Technology (MIT) and elsewhere were interested in the idea of magnetic core storage of information and greatly developed it for use in various computers. Wang published an account of his results in a 1950 article coauthored by W.D. Woo, another Shanghai native who worked at Harvard. He also patented his invention and, despite a long court fight, earned substantial royalties (money earned from sales) from International Business Machines (IBM) and other computer manufacturers who used magnetic core memories. These cores remained a basic part of computers into the 1970s. invented a digital logarithmic converter that made it possible to perform routine arithmetic electronically at high speeds and relatively low cost. Wang desktop calculators were soon available commercially, replacing traditional machines with mechanical parts. Several calculators operated on one processing unit. These early electronic calculators sold for over one thousand dollars per keyboard. They were used in schools, scientific laboratories, and engineering firms. By 1969, Wang Laboratories had begun to produce less expensive calculators for wider business use. However, Wang saw that the introduction of other technology would allow competitors to sell electronic handheld calculators at a much lower price than the machines his company offered. Confronted with the need to find new products, Wang directed his firm toward the manufacture of word processors and small business computers. The first Wang word processing systems sold in 1976. They were designed for easy access by those unfamiliar with computers, for broad data base management, and for routine business calculations. In addition to such computer networks, the company developed personal computers for office use. Wang began his business in a room above an electrical fixtures store in Boston, Massachusetts, with himself as the only employee. By the mid-1980s the company had expanded to over fifteen thousand employees working in several buildings in the old manufacturing town of Lowell, Massachusetts, and in factories and offices throughout the world. To acquire money to finance this expansion and to reward competent employees, Wang Laboratories sold stock and piled up a considerable debt. The Wang family retained control of the firm by limiting administrative power to a special class of shareholders. In the early 1980s when company growth slowed while debt remained large, Wang made some effort to reduce his personal control of the business and follow regular corporate management practices. While remaining a company officer and leading stockholder, Wang gave increased responsibilities to his son Frederick and to other managers. Wang intended to devote even more time to educational activities. He served as an adviser to several colleges and as a member of the Board of Regents of the University of Massachusetts. Wang also took a particular interest in the Wang Institute of Graduate Studies which he founded in 1979. This school offers advanced degrees in software engineering. Difficult times in the computer industry soon led Wang to turn his concentration from these projects and resume full-time direction of Wang Laboratories. In the last decades of the twentieth century, Wang's economic structure faltered. In 1982 the organization generated more than a billion dollars a year, and by 1989 sales were $3 billion a year. But Wang Laboratories fell on hard times as well. In the early 1990s the former minicomputer maker fell into Chapter 11 bankruptcy and Wang died of cancer in March of 1990 at the age of seventy. On January 30, 1997, the Eastman Kodak Company bought the Wang Software business unit for $260 million in cash. The deal put Kodak into the document imaging and workflow business and took Wang out of software. Wang also began a relationship with Microsoft, and Michael Brown, chief financial officer for Microsoft, sat on Wang's board of directors. The reorganization enabled the company to prosper once again. Wang's engineering insight and business success made him a fellow (member) of the Institute of Electrical and Electronic Engineers and a fellow of the American Academy of Arts and Sciences. He received an honorary doctoral degree from the Lowell Technological Institute. Hargrove, Jim. Dr. An Wang, Computer Pioneer. Chicago: Children's Press, 1993. Kenney, Charles. Riding the Runaway Horse: The Rise and Decline of Wang Laboratories. Boston: Little, Brown, 1992. Pugh, E. W. Memories That Shaped an Industry. Cambridge, MA: MIT Press, 1984. Wang, An, and Eugene Linden. Lessons: An Autobiography. Reading, MA: Addison-Wesley, 1986. Good job i really like it and all of the info was great! I was an employee with Wand in their educational field and was really proud of beeing with this fine company and had the Privilege to know An wan personally. He was a mastermind of clear and logical thinking as well as a very freindly person. His computers had 100's of features one would like to see and use today but with the financial failure (son Frederick) all these fine tools where put away for good because they would have structured computer-sales in an opposite direction wanted by its industry in 1990. His editor still is better than anything else in the market ans really easy to use and to learn 100% within 1 day. Also not to be beaten was his transformation Tool that allowed to read and write into data from oher Computers with a click in a compatibility-list and transform. An Wang stays in my heart for ever because his aim was to make our world easier in fact! Walters, Barbara Washington, Booker T.